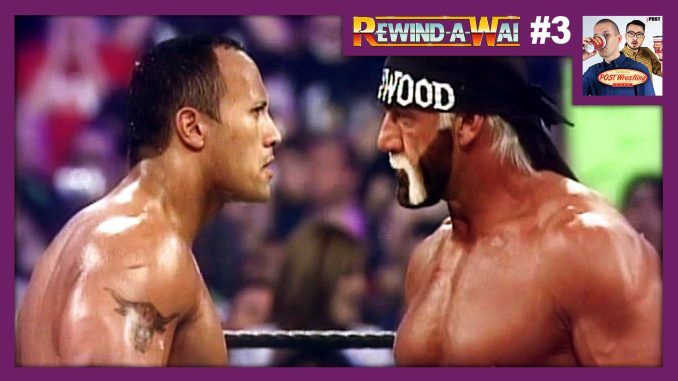 The third edition of REWIND-A-WAI is now available for all POST Wrestling Café patrons – go to Patreon.com/POSTwrestling to download OR check your podcast app if you have subscribed to the RSS feed provided to all members. John Pollock & Wai Ting travel back to March 2002 to review WrestleMania X-8 from The SkyDome in Toronto, Ontario. This show is brought to you by “Espresso Executive Producer” Ziggy Cao, who chose WrestleMania X-8 to be reviewed. Ziggy will join us to share his reasoning for picking this show and his memories of WrestleMania in Toronto. Pollock and Wai go back to 2002 and dive in deep to review WrestleMania’s return to Toronto. Both of us attended this show live and will share our thoughts on the event at that time period and how well it holds up today, the memorable match between The Rock and Hulk Hogan, the decision to put the Undisputed title match on last, the state of Steve Austin during this time period, the final pay-per-view before the first brand split, the odd pairings on this show and the natural comparisons to WrestleMania the year prior in Houston. *Steve Austin vs. Scott Hall *Edge vs. Booker T.
John Taylor, Ziggy Cao, Tyler Crane, Ryan Charkow, Chad Olsen, James Cunningham, Bruce Lord, Daniel Dunn, Hayden Schade, Roberto Macias, Brad Copping, Ian Kushner, Kris Ealy, Jonathan Ziegler, Brody Dasilva, Brent Nicol, Mitch Gelkopf, Thorsten Wendelmuth, Michael Darcy, Joshua Martin, Zubin Sundar, Michael King, Anthony Siniscalco, Jerry Kilgore, Alykhan Velji, Daniel Stack, Robert Holzhammer, Jay Scaife, Dustin Koga… and all of our patrons of the POST Wrestling Café.